I’m always excited to take some of the classic and traditional desserts that a lot of people grew up on and trying to come up with cool new ways to experience them. I Always have been. That and figuring out how to make some of those store bought treats we all enjoy homemade (will probably come later). I think that’s always how I’ve looked a baking as a way of being adventurous and expressing myself. Am I always successful…Well no…but its part of the fun. Banana Pudding is another one of those tricky southern classics. I seem to be just asking for controversy. Some people swear by the cold version with whipped cream and some people swear by the warm version with the meringue nicely browned on top. Some people swear by the tried and true pudding mix in the box and some swear by the scratch made vanilla pudding. My hope is that these cookies can initiate a truce in the banana pudding wars. My mom can be a total diva when it comes to banana pudding. Me, I can take it either way, I tend to be a go with the flow kind of girl. When I make it for her it has to be done a very specific way….its actually kind of hilarious. It has to be the cold version; she hates the warm version with a passion. The cream has to be fresh whipped cream and the bananas must be diced into tiny pieces and not sliced. The pudding is box mix all the way. She does not like the scratch made stuff at all. Since I have discovered this recipe for Homemade Vanilla wafers in the last couple of years, now the cookies have to be homemade vanilla wafers. Can somebody say “DIVA”? We only eat it around special occasions so I don’t mind the little extra effort, plus if it makes mom happy right. So how would you feel if I said Banana Pudding that you can take anywhere and not worry about having a melty goopy mess? Stay with me people. I know you don’t believe me but this cookie actually taste just life banana pudding and if you still need the goopy try putting a scoop of Marshmallow Crème between two. Your eyes are sure to roll into the back of your head. 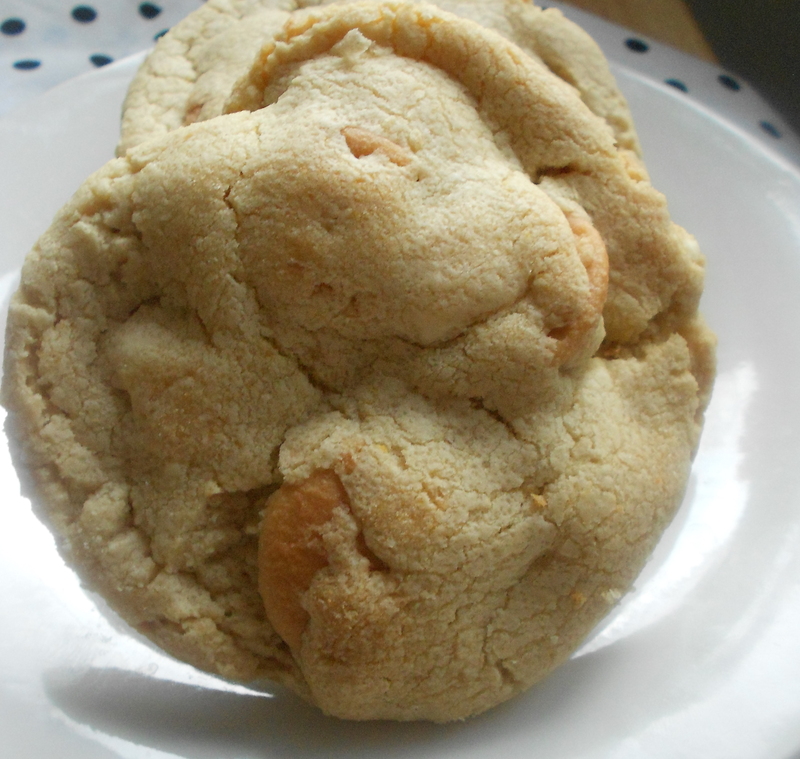 This cookie gets it banana flavor form the addition of banana pudding mix and banana flavoring. 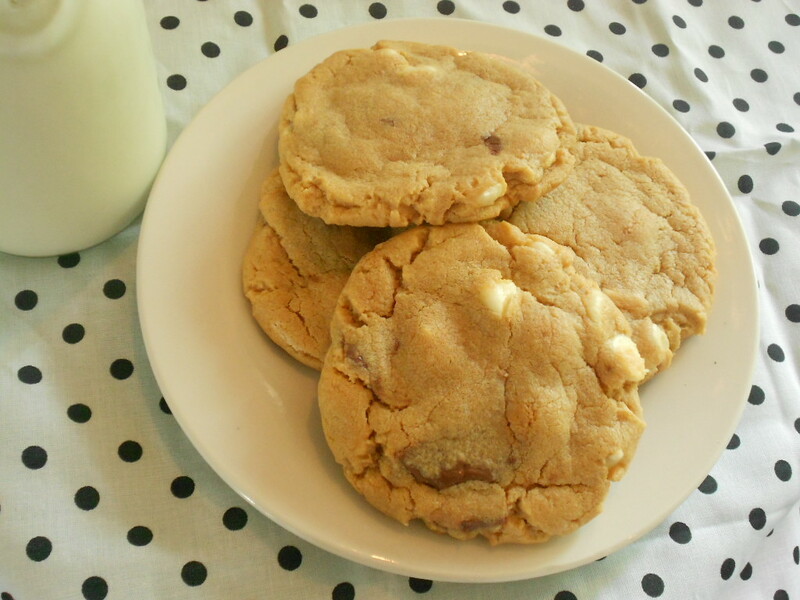 And now I’m going to blow your mind, I put a cookie into a cookie, crushed vanilla wafers go right in to the cookie batter along with white chocolate chips. Preheat oven to 350 degrees. In a medium bowl combine the flour, cornstarch, pudding mix, baking soda and salt. Whisk to combine and set aside. In the bowl of an electric mixer cream the butter and sugars until light and fluffy. Add the egg and vanilla and banana flavorings. Add the flour and pudding mixture and stir until just combined. Add the white chocolate chips and vanilla wafers. Using a ¼ cup scoop the cookie dough and roll into a ball. Place the cookie dough balls on a parchment lined baking sheet. Slightly flatten each ball. Cover with plastic wrap and place the cookies in the fridge to chill for two hours. Place the cookies in the oven and bake for 350 degrees for 11 minutes. I stuffed a mini peanut butter snickers into a chocolate cookie. I guess I have to explain more than that, but if somebody told me that I pretty much wouldn’t have to hear anything else. My hand would be out and I would be salivating. These cookies were not planned; In fact I went to the grocery store for supplies intending to make a totally different cookie recipe. I walked into the store and once again those freaking buy one get one free signs started calling me and I found myself instantly distracted from my initial goal. I’m not to upset because the cookies came out that distraction. I found a giant bag of mini peanut butter snickers which was essentially half priced, how could I possibly pass that up and plus I have been dying to stuff something inside of a cookie ever since I laid eyes on this recipe for Blahnik Baker ( btw how awesome is her blog, If you havent checked it out you so totally should). 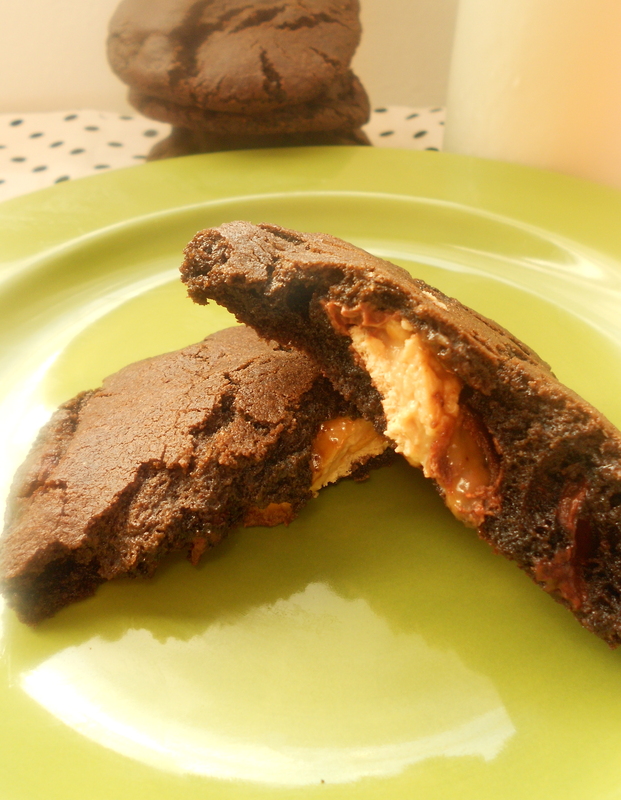 So that leads us back to my first statement: I stuffed a mini peanut butter snicker inside of a chocolate cookie. This cookie satisfied every part of the chocolate lover in me and plus the ooey gooey peanut butter snicker in the center made these EPIC!. I think Inhaled about 3 of these while they were still warm and then I realized at some point if I was going to share the recipe I would have to save some to photograph. Trust me it was a very very hard thing to do, but that is how much I love you guys. In medium bowl whisk together flour, cocoa powder, cornstarch, baking soda and salt. In the bowl of an electric mixer cream together the butter, sugar and brown sugar until light and fluffy. Add the egg and vanilla and mix until combined. With the mixer on low speed add the dry ingredients and mix until just combined. Gently stir in the chocolate chips. Allow the cookie dough to chill for 2 hours. Once dough is chilled drop one tablespoon of dough on a parchment lined cookie sheet and press an unwrapped mini snickers in the center. 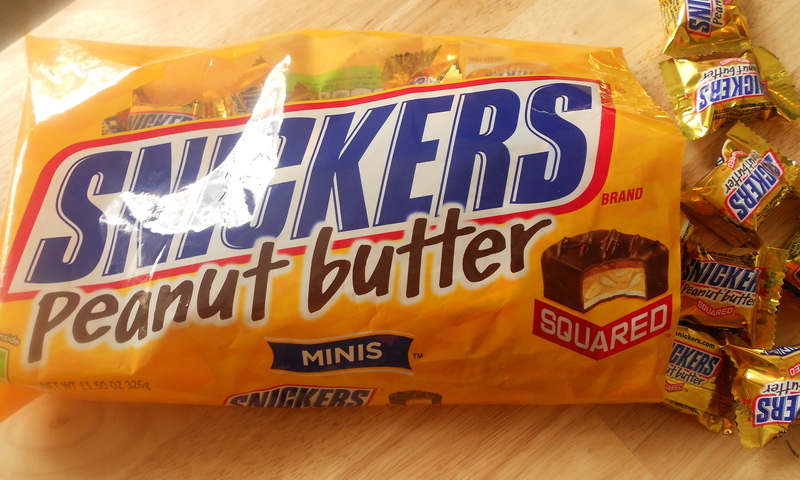 Drop another tablespoon of cookie dough on top on mini snickers. Roll the dough to form a cookie dough ball and completely cover the candy. Bake the cookies for 8-10 minutes or until edges are slightly set. Once removed from the oven allow cookies to cool on baking sheet for 5 minutes then gently transfer to a baking rack and let cool completely. So it seems that time of year is slowly creeping up on us. You know the one. It involves staring at a sea of pink and red in just about every store you enter. 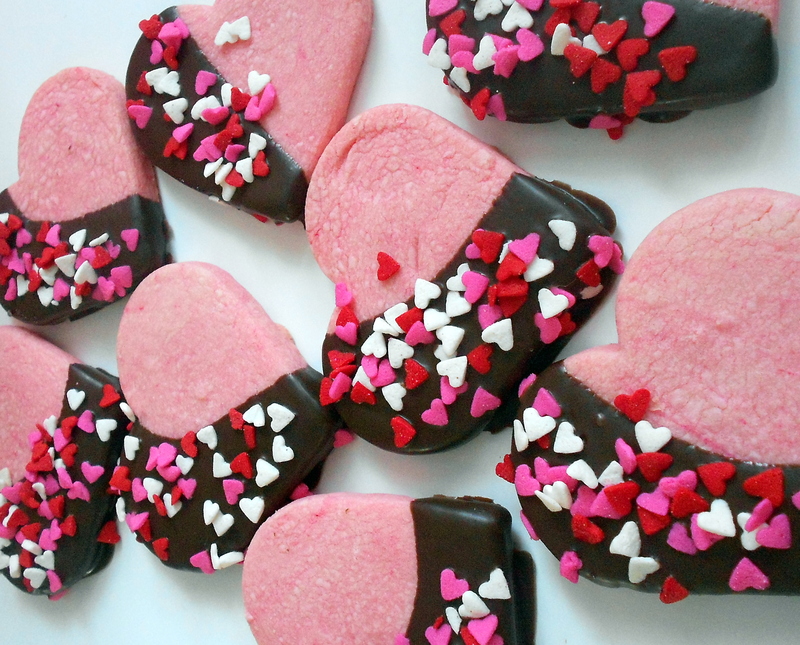 Everything is heart shaped and/or covered in chocolate. (FYI: I’m totally all for the covered in chocolate part). And you can’t walk two feet without tripping over roses, balloons and stuffed animals holding hearts with cutesy messages on them like “I love you Bear-y much”. Yes good people it is Valentine’s Day and if you’re single like me it can kind of be the pits, but I’ve decided there’s no point in being bitter about it. Valentine’s Day is one those holidays that if you let it can make you feel kind of lonely if you’re not part of a twosome. That’s not what I’m going for this year. I’m going to embrace it and I’m going to celebrate it and I’m going to bake cookies. Ill probably take them to work and pass them out. Just because I don’t have a valentine doesn’t mean I can’t spread some love. That’s the outlook I’m trying to go with this year. Focus on the Positive and not the Negative. And who’s to say me being single is a negative thing right now. With all the changes I have going on in my life recently my focus is being pulled in so many directions it really wouldn’t be fair to take on a relationship right now. So maybe this year I’m not celebrating being part of a couple or having one specific valentine, I still can celebrate the people in my life that I love and they can all be my Valentine. That includes you guys! 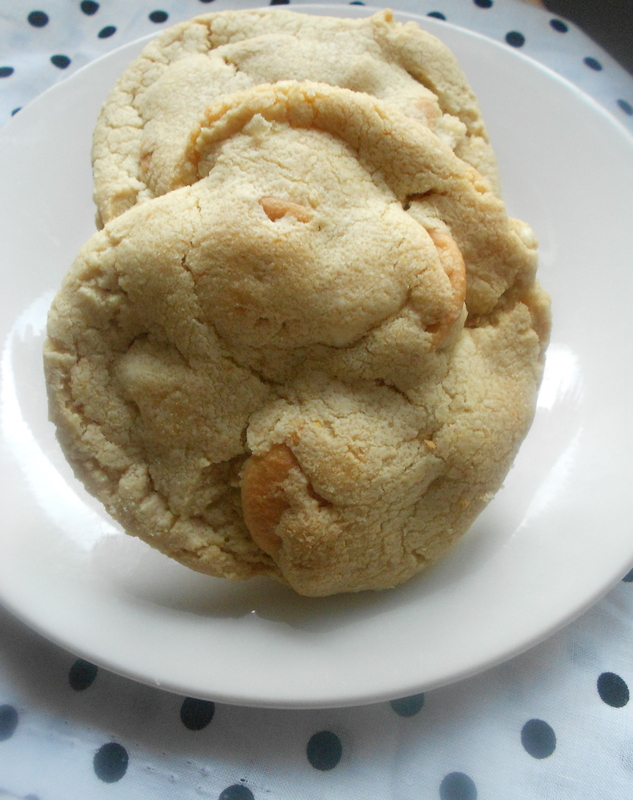 And to show you just how much I love you I’m going to share these amazing, buttery shortbread cookies. 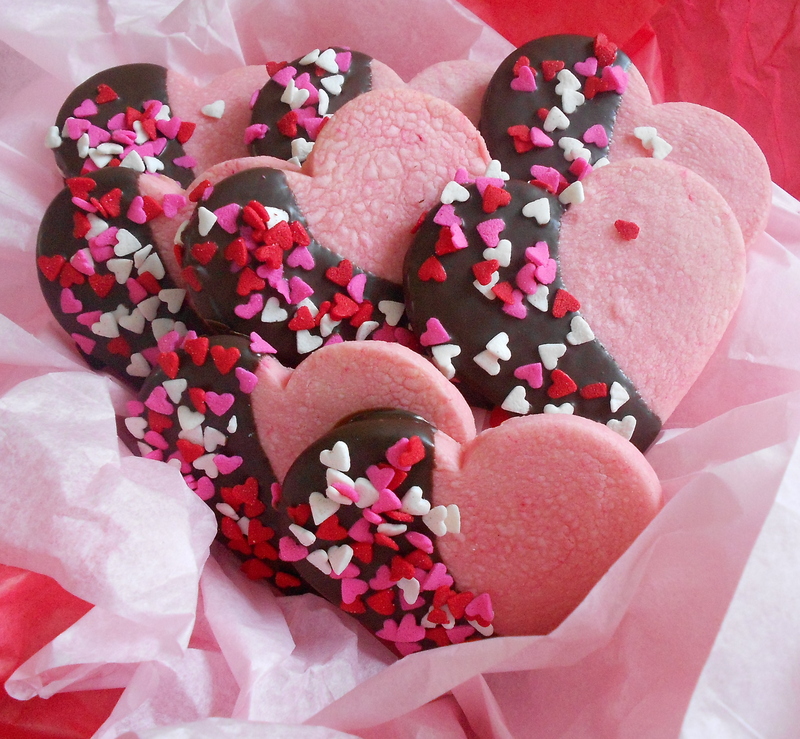 And because I’m in a festive mood, let’s make them pink and heart shaped. And to show how much I really love you, let’s dip them in chocolate! Your welcome!! Preheat oven to 350 degrees. In a medium bowl, combine the flour, cornstarch, baking powder and salt. Whisk together to combine and set aside. In the bowl of an electric mixer or with a hand mixer cream the butter and powdered sugar until fluffy. Add the vanilla and beat to combine. Add the drops of pink food coloring. With the mixer on low speed, slowly add the flour mixture and mix until just combined. 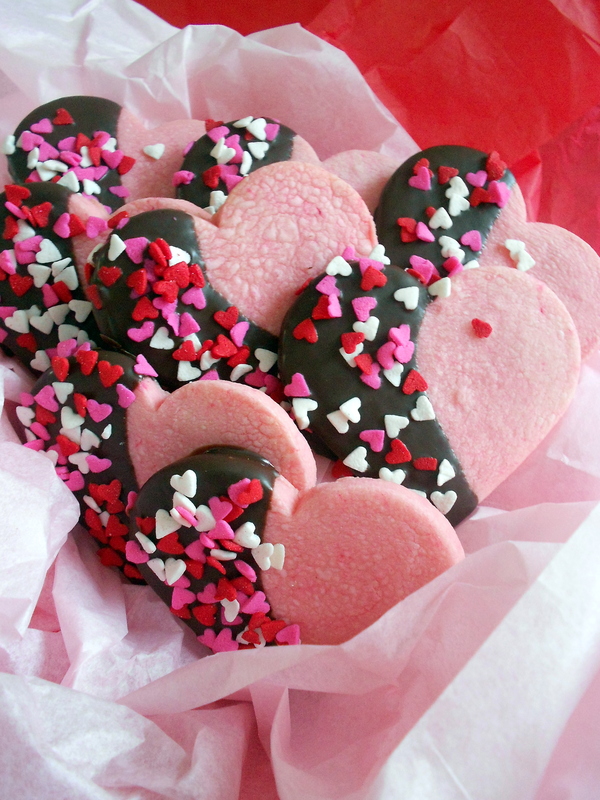 Place the dough on a lightly floured surface and Roll out about ½ inch thick and cut out heart shapes. Place the cookies on a parchment paper lined cookie sheet pan. Place the pan in the refrigerator and let the cookies chill for 30 minutes. Once the cookies have chilled, bake for 15 minutes or until cookies are set. Place cookies on a wire rack and let cool completely before dipping.
. To melt, place the Chocolate in top pan of a double boiler or in bowl placed over simmering water. Stir constantly until smooth and melted. 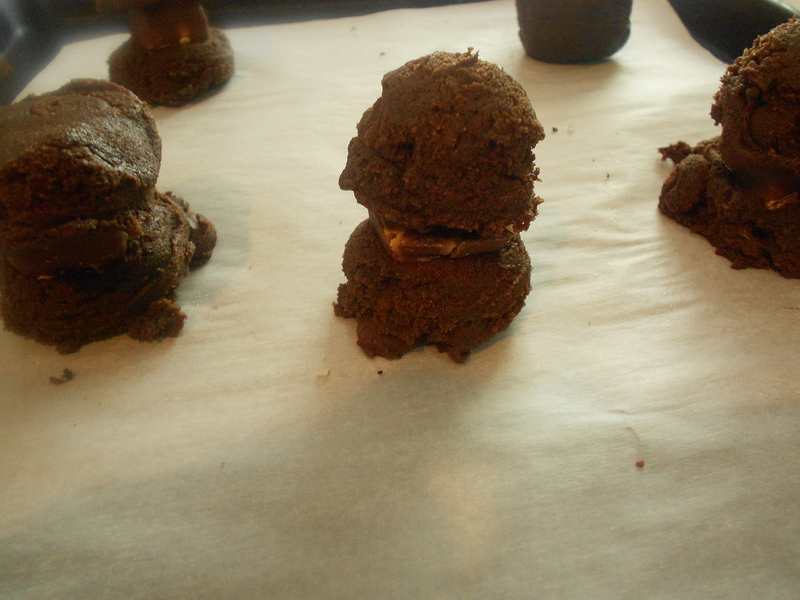 Dip each cooled cookie in the dark chocolate candy coating making sure only to coat half of the cookie. Remove it from the chocolate lifting up, letting the excess drip back into the bowl. Place the dipped cookie on a parchment paper lined sheet pan. Drop a few of your festive sprinkles on top of the chocolate. Let the chocolate set for about 15 minutes or if you want faster result you can pop them in the fridge until the chocolate is set. Repeat this process with the rest of cookies. Do you ever look through your pantry and come across something you bought for a recipe ages ago. You only needed a little bit and once you used it, it ended up shoved to the back of the pantry or cabinet more than likely never to be used again. This is basically what happened to me when searching through my pantry I found a practically full jar of molasses. So I decided to try my best not to be the waster that I can be sometimes (Hey! Don’t judge I’m working on it) and instantly started to brain storm some ideas for treats I could use molasses in. The first thing that came to mind was gingersnaps, but I have to say unless they are crushed and used as a crust for something like cheesecake or Alton Brown’s City Ham recipe I’m not really a big fan. But I still liked the idea of a molasses cookie; especially with the holiday season approaching I could always use some new holiday cookie ideas. Molasses has a very strong and distinct flavor in fact I find kind of harsh, which I guess is why I don’t use it a lot. I figured if I added chocolate it might help to bring help take away some of the harshness, plus I never pass up the opportunity to throw chocolate into a recipe. I took the basic flavors and spices of the traditional molasses cookie and incorporated chocolate and the outcome was amazing. Let’s face it Chocolate makes everything better. 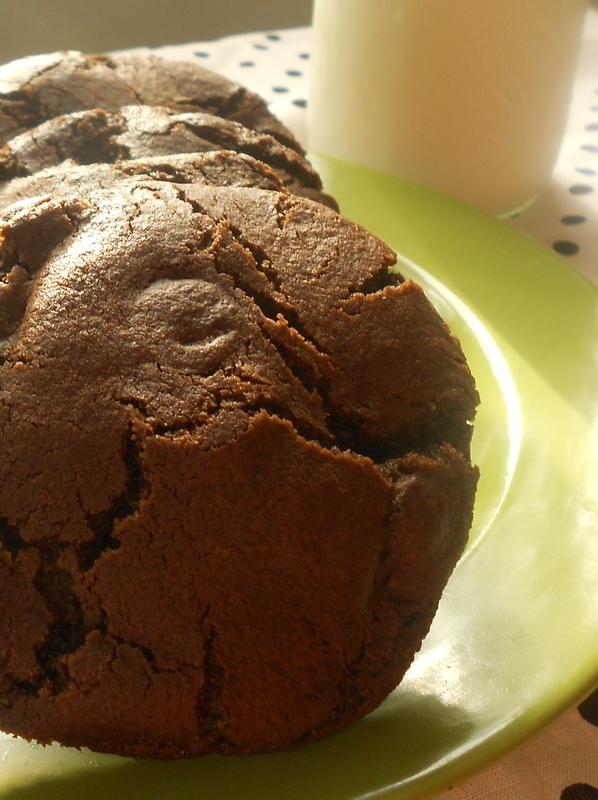 The result was a soft and chewy chocolate cookie with a hint of spice. 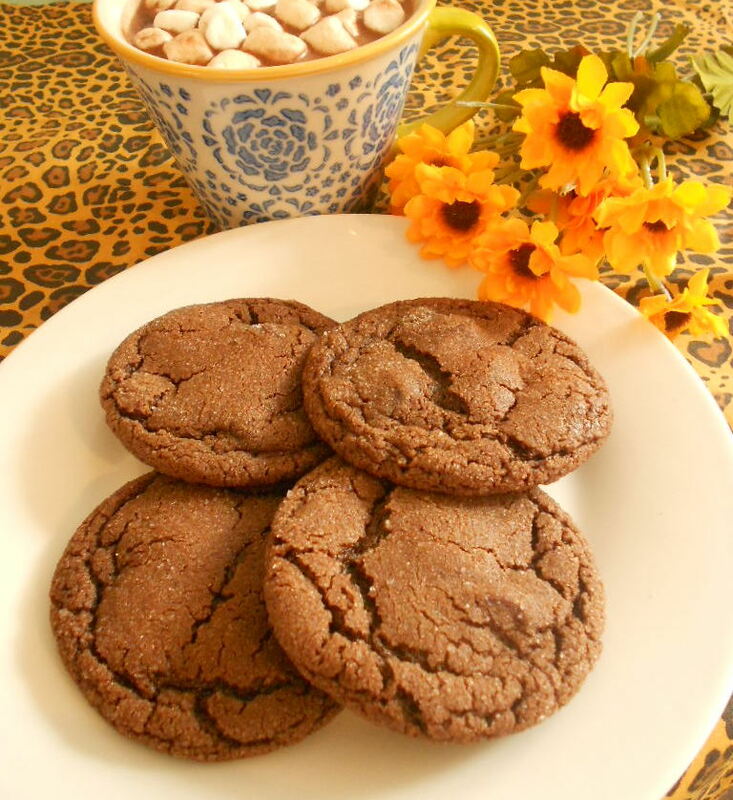 These cookies taste incredible and with the cold weather moving in on some of us are perfect with big cup of hot cocoa! With the holiday season approaching I know all you awesome people are already in full blown holiday cookie mode, I would love to know what Holiday cookies are you guys making this year? In medium bowl whisk together flour, cocoa powder, baking soda, salt, ginger, cinnamon, nutmeg and cloves and set aside. In bowl of electric mixer combine melted butter, brown sugar and ½ cup granulated sugar. On medium speed mix until well combined and sugar is dissolved (about 3 minutes). Reduce speed of mixer and add egg. When egg is fully incorporated, turn the mixer off and add the molasses. I find that if I add the molasses with while the mixer is still going most of it ends up around the top sides of the bowl. Turn the mixer back on low speed and mix until the molasses is fully incorporated. With the mixer still on low speed add the dry ingredients and the chocolate chips and mix until just combined. Cover mixing bowl with plastic wrap and chill in refrigerator for 1 hour. Place the remaining 1/3 cup sugar in a small bowl and set aside. Once dough has chilled using a small ice cream scoop or tablespoon to scoop dough into palm of hand and roll into a ball. Then roll each ball of dough into the small bowl of sugar making sure it is completely coated and place on a parchment paper lined baking sheet about 1 to 1 1 ½ inches apart. Bake in preheat oven for 9 to 10 minutes. Cookies will be puffy when you remove from the oven but will collapse while they are cooling. Let cookies cool on baking sheet for 10 minutes then transfer to a wire rack to finish cooling. Ambrosia salad is very special to a lot of people. It’s something that has been around for ages and in most cases passed down from generation to generation. I always think of it as such a southern thing which I’m pretty sure it’s not nonetheless it can be extremely sentimental for a lot of people. Just the sight of the white fluffy stuff can instantly transport people back to their childhood. The truth of the matter is I never grew up with Ambrosia Salad. Its one of those things that my mom ate and saw so much of as a kid that once she hit adulthood she never wanted to see the stuff again…which means I never saw the stuff. And to be honest I didn’t really miss it. Calm down people, this isn’t an Ambrosia bashing post it’s just me being up front about my relationship with it. Weirdly enough I never really thought about it much until the first time I made a batch of coconut macaroons. As I was mixing it up thoughts of Ambrosia salad popped into my head and I wondered if I could put those classic flavors into one cute little cookie especially since coconut is a huge part of it. So here it is….I think it captures all the flavors pretty spot on having finally partaken of the delicious fluffy stuff as a now grown up but even if it doesn’t send you back to your childhood with the first bite it’s still a pretty darn good cookie…and kinda cute too if I say so myself. Preheat oven to 350 degrees. Pour entire can of crushed pineapple (juice and all) into a medium saucepan. Cook on medium heat until all the juice has evaporated making sure to stir constantly to avoid sticking. Set aside to cool to room temperature. In a microwave safe bowl combine sweetened condensed milk and marshmallows and place in microwave for 15 seconds. Stir to combine and continue to microwave for 15 second periods until marshmallows are fully melted and mixture is smooth. Add coconut, pineapple, orange zest, vanilla and *toasted pecans to marshmallow mixture and stir until everything is combined and moistened. Drain and cut maraschino cherries in half. Place rounded tablespoons about 2 inches apart on a parchment paper lined baking sheet. 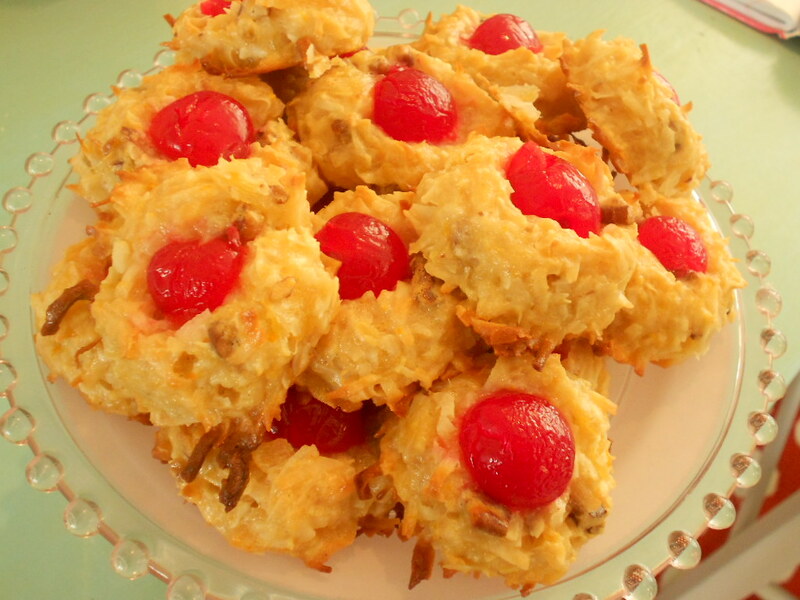 Place a maraschino cherry half cut side down in the center of each macaroon. Bake cookies for 15 to 18 minutes or until cookies are light golden brown. Let cool on baking sheet for a few minutes the gently remove with a metal spatula and move to a baking rack to cool completely. *To toast pecans: Preheat oven to 350 degrees. Spread the Pecans in a single layer on a baking sheet lined with parchment paper. Bake for about 5 to 8 minutes, the pecans should be slightly browned and you should be able to smell them. If you don’t want to go through the effort of toasting the pecans just chop em up and throw them on in there. Need I say more? Probably not, but this would be a very short blog post which if the end result was these awesome (there’s that word) cookies wouldn’t really be a bad thing. First I want to thank Two Peas and Thier Pod for introducing me to pudding mix in cookies. Using pudding mix in cookie recipes was such a revelation for me because it has soooo many possibilities which will undoubtedly show up here. I wish I had some long and interesting explanation about how these cookies came to be but it was literally as simple as seeing a box of cheesecake pudding mix, a bag of mini peanut butter cups and a jar of peanut butter and a light bulb going off in my brain. These cookies are soft and chewy and oh so good! There is a great balance of peanut butter flavor and cheesecake flavor. I added white chocolate chips for that little extra creamy feel and mini peanut butter cups because, well if I’m being honest it just seemed like it would work really well. I was really excited about how this cookie turned out. Especially when they’re still warm (O.M.G!) don’t even get me started. All you need is a glass of milk, or in my case soy milk. In medium bowl whisk together flour, salt, baking powder and baking soda and set aside. Using a mixer beat together the butter and peanut butter until smooth and creamy. Add the sugars and beat until creamy. Add the pudding mix, then the eggs and vanilla. Add the dry ingredients and mix until just combined. Gently stir in white chocolate chips and *mini peanut butter cups. Drop the cookies by rounded tablespoon or medium sized ice cream/cookie scoop onto parchment paper lined baking sheet. Bake for *8 to 10 minutes or until edges are slightly golden. Let cool on baking sheet for a few minutes the transfer to a cooling rack to cool completely. * The bake time is 10 minutes but as a preference I like to under bake my cookies a little because they continue to cook on the baking sheet once you pull them from the oven.